Raccoons may impress us all with their uncanny intelligence and human traits, however, this does not make them ideal house guests. Raccoon presence in a human dwelling is associated with costly damage as well as health concerns. In order to improve the usability of the domestic space through humane wildlife removal, North York citizens must use the removal and deterrent measures that suit the species being targeted. It is therefore important for residents to be able to identify raccoon presence in the home. One way to do this is by examining tracks. The shape of the tracks is one of the ideal ways to identify raccoon imprints. Raccoons have paws that are eerily similar to human hands with five long digits on all four limbs. Each digit ends in a sharp point from the raccoon’s claw. It goes without saying that an imprint that resembles a human hand with what appears to be five fingers instead of four fingers and a thumb is likely to belong to a raccoon. It is also important to look out for the size of the tracks because you can also use measurement to determine whether tracks being examined belong to raccoons. For raccoons, the paws on the front limbs are smaller hand those on the hind limbs. If the tracks reflect a pattern of small imprints followed by larger ones then the odds of them belonging to a raccoon are increased. When checking your soffit and roof, you’ll notice tiny tracks of dirt from the dirty paws of a raccoon. The location is another telltale sign that indicates that the tracks you are observing belong to raccoons. Raccoons love to forage around garbage disposal sites, especially if the garbage contains food leftovers. If the area around the bin is muddy, then the tracks will likely be seen all over the container, looking like a small person was clawing along the sides. Raccoons, like other non-hibernating animals, will also make tracks in the snow as they travel towards their food sources. A unique feature of raccoon tracks in soft material like snow is that the rear prints are usually deeper than the front ones. This is caused by the fact that raccoons’ hindquarters are heavier than the remainder of their bodies. Smeared prints reflect the raccoons’ attempts to grasp onto something to climb and are often found on sidings and soffits. Found Raccoon Tracks? What next? Once you’ve identified the tracks around your space as belonging to raccoons, you can take the next step. This step, of course, is the implementation of humane wildlife removal methods. 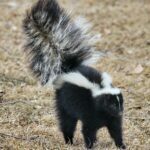 When you know you’re dealing with raccoons, you can identify removal and exclusion strategies that will help to restore your space to its former wildlife free condition.By far, the best way to ensure that you get raccoons to leave your property and stay away without harming the animals, yourself or others is to get the experts involved. 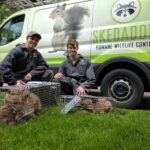 Experts like Skedaddle’s humane wildlife control teams are trained and experienced in the art of wildlife prevention and control. Our expertise in animal behaviour equips us perfectly to provide humane wildlife removal services to the North York area.